Moss "Boulders" ranging in size from 2-3.25" wide. 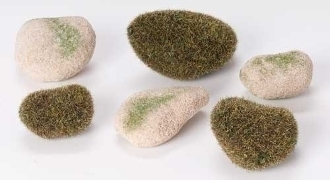 Realistic moss and stone appearance for your fairy garden - but made of styrofoam so you can stack, insert picks, or glue to create your own dimensions. Makes a GREAT retaining wall!